Galactic Menace at the PRESSURE POINT–Review and a FREE Book! Hi there! I’m excited to share a review for a new space-opera, sci-fi novel from Adam Quinn. 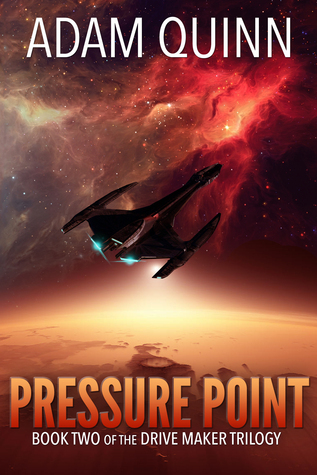 PRESSURE POINT is the second book in his Drive Maker series, and you’ll need to read FLASHPOINT for it to make sense. But, FLASHPOINT is FREE on Amazon through today, so rush off and pick that right up. What does a galaxy fear? Six weeks after the Trascion Crisis, the Alliance is long dead—but its secrets are not. Taylor Ghatzi knows the truth lies within her enigmatic dreams—if she can decipher them before the Kaleknarians make their next move. On the other side of the galaxy, Cherran DeGuavra is trying to wrangle the five powers into an agreement that will open up a new era of pan-galactic cooperation—until developments within his own government threaten the foundations of interstellar order. As Taylor and Cherran battle Kaleknarian plots and Meltian politics, little do they know more than peace is at stake. Taylor Ghatzi is an Admiral from the Order Wars, but lately she’s been an officer of the emergency services that scour the galaxy to aid ships and planets in peril. Most recently, she and her cobbled-together crew halted an invasion force of Kaleknarians (an insectoid species bent on ruling the galaxy) and they seem to be on the rebound to continue to halt Kaleknarian aggression, but that’s not all. In unraveling the Kaleknarian strike forces, Taylor, a powerful telepath, must untangle the recurrent dreams she’s been having. It’s clear that some being is projecting messages into Taylor’s subconscious, but is that relevant to the cause? Also, the deeper Taylor and her compatriots get to crippling the Kaleknarian forces, the more she recognizes that Kaleknarian’s are not completely responsible for the most recent aggression. No, a mind-altering Spartan Plague is converting the Kaleknarians into supersoldiers built for invasion. Meanwhile, the slipperiest of all politicians, Ryan Harrison, is mounting a bid for President of the Meltian Alliance. Cherran DeGuavra, ambassador to the Pan-Gal consortium, an association of the five galactic powers that helps maintain order, has been tasked with running against Harrison. For good reason; Harrison is a shady, shady dude. Cherran’s most important job however, is to get a resolution passed to form a defense force against aggressive forces. At first, it was conceived to hold the Kaleknarians, but now the Spartan Plague seems to be the greatest threat. Even as the time ticks away, we can see that Taylor’s efforts to understand her expanded telekinetic powers will be keenly tested. And Cherran’s efforts to unite the five powers into taking down the Spartan Plague will likely be hard fought and hard to maintain. It’s a tough battle, and there’s plenty of cloak-and-dagger work that doesn’t go exactly to plan. Okay, it goes nothing like the plan. There’s so many layers of misdirection, it’s hard to pin down the real perpetrators, but Taylor does the absolute best she can with the limited tools she has to hand. There’s a lot of space jargon, and the names of some of the characters–and alien species–gets a bit overwhelming at times. Still, there’s no question that the stakes are exceedingly high, and the risk of galactic collapse equally dire. This is meant to lead into the third book in the series, so we have some resolution regarding the Kaleknarian menace, and a whole new problem with the Spartan supersoldiers. Who is pulling their strings remains a mystery, but Taylor isn’t giving up, and her comrades are dedicated to saving as many lifeforms as they possibly can. There’s a touch of romance here, for Taylor and her crewmate Hezekiah, but it’s tempered by the realities of their predicaments. Do not expect heat. In all, it’s an ambitious and creative space-opera series that’s got plenty of gizmos, tough chicks and intrigue. I like it bunches. Interested? You can find PRESSURE POINT on Goodreads and Amazon. And don’t forget to pick up FLASHPOINT-FREE through 1/20. Adam Quinn is a Chicago-based author of science fiction and space opera. When he’s not writing about the technology of the future, he’s studying engineering so that one day he can help create it. Looking for more of Adam’s work? Check out his Facebook page, or his website to learn about all his current work, and subscribe to his newsletter to make sure you’re the first to know about new releases.